Altec Electronic Systems :: Media Game Rooms. Many of today's homeowners are incorporating multi-purpose rooms into their living space. Family Rooms and Great Rooms are being transformed into Media Rooms, a place where family and friends can relax in a casual atmosphere and enjoy a movie, concert, sporting event or TV show. If its gaming you enjoy, we can design a room with an arcade atmosphere filled with music and HD video displays. AES can provide the solutions you desire to keep you at the top of your game from Atari to X-Box Consoles to state of the art Golf Simulators. The possibilities in Media Games Rooms are endless. Conventional looking Rooms. Many of the room furnishings are what youd find in a conventional family room, couches, recliners, a coffee table. Out of Sight Audio/Video Equipment. Most of the Audio/Video equipment is out of sight housed either in cabinetry or remotely located in other areas of the house. Speakers in sync with Room Decor. In-wall speakers can be painted or wallpapered over to blend into the decor of the room. Out of sight Display Screens. 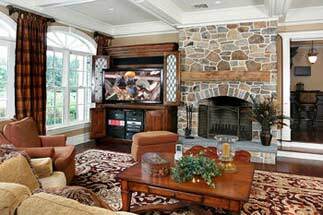 Plasma displays can be wall mounted above a fireplace or piece of furniture, motorized screens and projectors can be lowered from the ceiling where they remain out of sight when not in use.